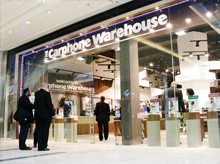 Since trading began in 1989, The Carphone Warehouse Group PLC has achieved phenomenal growth by focusing on customer service and providing an infrastructure that is unrivalled. Their aggressive expansion plans have made them the largest independent retailer of mobile communications in Europe. They are now in 12 countries and have over 1,085 stores. Their continued success lies in their ability to offer customers consistently simple, impartial advice on everything to do with mobile communications. The business is divided into three segments, distribution, comprising retail, online, wholesale and insurance; Telecoms Services, comprising on-going airtime revenues, the facilities management business and the MVNO, Fresh; Data Services, comprising and encompassing mobile services and products. A key part of the Carphone Warehouse Group is the Logistics Centre at Wednesbury in the West Midlands. The Wednesbury site was acquired when the Group took over Tandy in 1999 and it now handles all warehousing and deliveries to the 500 UK stores and has a large Repair Centre, repairing phones for Carphone Warehouse customers. An IBM AS/400 720 computer with 2GB of memory and 134GB of RAID protected disks, controls all aspects of the warehouse and distribution system. The software running on it, under OS/400 4.3, is a JDA Merchandise Management System, originally bought by Tandy in 1995. As the company grew and disk utilisation levels soared, Nigel Passmore, IT Manager at Carphone Warehouse, Wednesbury, watched with dismay as the level started to exceed the 80% level recommended by IBM. “We were frequently getting to the 95% level where the performance of the AS/400 was seriously affected and twice we reached 100% at which point the system reset itself with disastrous consequences. The whole department seemed to be spending all of our time trying manually to keep disk space free and dealing with disk problems, really panicking when the level reached 99%.” recalled Passmore. Carphone Warehouse also uses the maxMessenger and maxAlarm modules from Maximise’s suite of System Management tools. maxMessenger monitors the AS/400 for any messages and ﬁ lters for important messages, enabling staff to take action before it becomes a problem. The maxAlarm module sends pager-type messages to mobile phones. Using the Disk Management features of maxMastermind a user can drastically reduce the time taken to manage objects and libraries. There are a large number of features that will aid with every stage of Disk Management. maxMastermind provides information that will automatically manage file sizes and deleted records, list objects that have been missed by normal back up routines, include functions to locate redundant and un-used objects and even locate any objects across a network of iSeries machines. There are also a large number of pre-deﬁ ned reports that can be produced for auditing and information purposes e.g. multi machine library comparison report and save ﬁ le space occupancy. maxMastermind stores complete object level history therefore reducing the time and cost of computer audits. The user can also verify that change control procedures are being adhered to by using maxMastermind’s high-level automatic inquiries and reports. Management of valuable resources is one of the essential responsibilities of all IT departments. With all the tools shipped with maxMastermind any unnecessary purchase of extra disk or larger AS/400s can be avoided. Human resource management can also be improved by making sure that skilled personnel are available to carry out other essential tasks.